The MOBIDIS speed display can be set up quickly wherever you want to increase traffic safety. The MOBIDIS mobile speed display from Jenoptik increases traffic safety wherever there is a short-term need. Thanks to its compact and lightweight construction, you can set up the speed display quickly, for example around sporting events, at road works or in driver training centers. The device's radar sensor records the speed of approaching vehicles quickly and reliably. The speed immediately appears on the display. A smiley face or sad face provides an additional visual indication to drivers to inform them if they need to slow down. 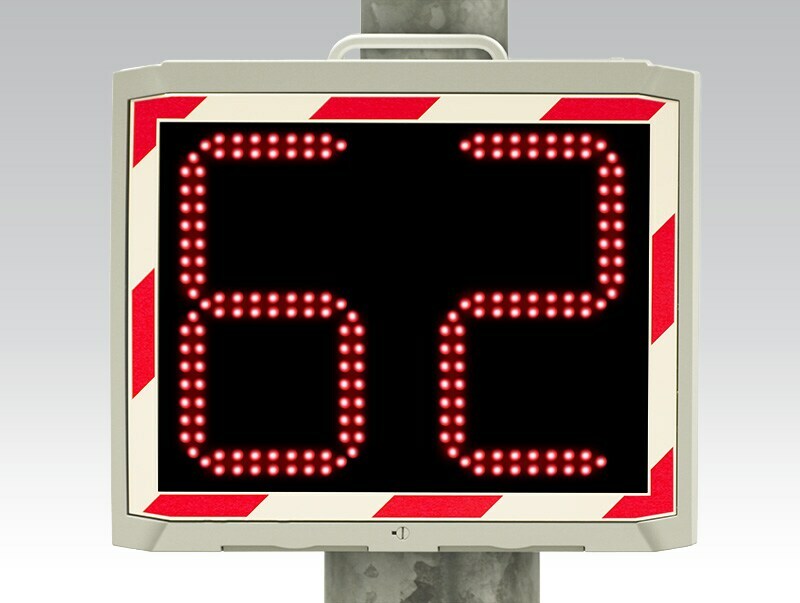 The speed display can be seen clearly from a distance of up to 150 meters. Powerful LEDs automatically adjust their brightness according to ambient lighting conditions and therefore remain clearly visible both in sunshine and late into the night. Mobile: Compact and lightweight speed display that can be set up quickly and flexibly anywhere. Positive and negative feedback: A smiley face or sad face informs drivers immediately whether they are going too fast. Durable: The housing withstands bad weather conditions; a Plexiglas® screen protects the display. Automatic brightness: The LEDs adjust to darkness or sunshine. Events and festivals: For example at sporting events. Road works: Increased traffic safety around your road works.